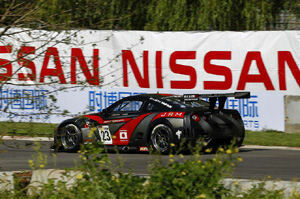 The Young Driver Aston Martin team completed a stunning double in a dramatic ninth round of the championship in Beijing. The combination of Darren Turner and Stefan Mücke in the No.8 Young Driver Aston Martin DB9 took the chequered flag in the Championship race to record their first victory of the 2011 season. The result crowned a perfect two days for the German squad after Tomas Enge and Alex Müller in the No.7 sister car had taken the honours in the Qualifying race earlier in the day. Third place for Lucas Luhr and Michael Krumm in the No.23 JR Motorsports Nissan GT-R consolidated their lead of the drivers' championship. The other three GT-R's in the field also all put in great showings to secure top eight finishes, with the No.20 Sumo Power GT crossing the line in sixth, the No.22 JRM seventh, and the No.21 Sumo Power GT eighth. 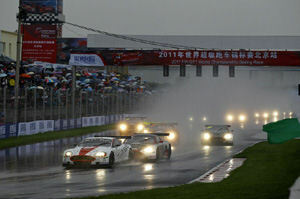 The race started and ended under the safety car after a heavy downpour before the start made for treacherous conditions at the Goldenport Circuit. It was looking like an Aston Martin 1-2-3 for the second consecutive race, with Enge in the No.7 Young Driver AMR chased by his team-mate Turner in the No.8 car and the No.4 Hexis AMR of Piccini following suit, but the rate of attrition was high with only nine of the 18 starters running at the chequered flag. When the Nissan X-Trail finally went back into the pits after guiding the cars for the start, it wasn't to be for long, as instantly, in the space of half a lap, three cars, among them Marc Basseng in the No.38 Lamborghini Murcielago, span out. In the brief amount of time that race conditions were active, Nick Catsburg, in the No.20 Sumo Power GT, found himself able to make up three positions to sixth. Richard Westbrook in the No.22 JRM Nissan GT-R on the other hand was less lucky, as a puncture forced him to pit, dropping him to the back of the pack. That meant that the GT-R's reconvened behind the once again deployed Safety Car in fourth (No.23), sixth (No.20), 10th (No.21), and 15th (No.22), but the No.22 JRM soon gained a place back to 14th when the No.37 Lamborghini Murcielago span out. The all-important pit window was to open just a minute after the Safety Car re-emerged back into the pits, and as ever it was to have a bearing on the cars' running order. Turner in the No.8 Aston Martin got out ahead of his team-mate Müller in the No.7 Young Driver Aston Martin, while Piccini in the Hexis No.4 leapfrogged both of them to grab the lead. The No.23 JRM Nissan GT-R came out a position down behind the No.41 Marc VDS Ford GT, but Krumm, fresh behind the wheel managed to quickly regain fourth position. The No.20 Sumo Power GT of Enrique Bernoldi, passed to drop to seventh just before the window's opening, found itself up a position to sit sixth again, whilst its No.21 sister car remained in 10th. 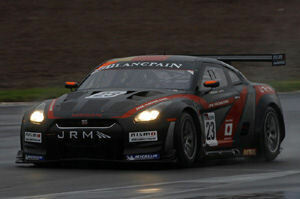 However, it was the No.22 JRM that was by far the biggest pit window beneficiary - up a massive seven places to seventh. However, the No.22 JRM would soon lose a position Nico Verdonck in the No.12 Exim Bank Corvette, who also provided great entertainment in a heated squabble over fifth place with Enrique Bernoldi in the No.20 Sumo Power Nissan GT-R. The honours eventually went to Verdonck even though Bernoldi crossed ahead of him af the flag. The stewards ruled Bernoldi's overtaking move under the safety car was illegal and relegated him to sixth. 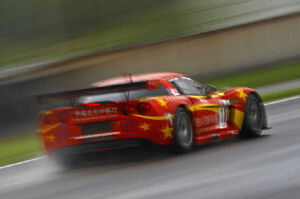 Meanwhile, David Brabham, in the No.21 Sumo Power GT, moved up a place to ninth. Up front, Krumm in the No.23 JRM car had closed the gap to the third placed No.4 Hexis Aston Martin to just over half a second, but when the Safety Car was yet again sent out on track with five minutes of the race left following a spin by the No.12 Chevy Corvette, it looked like the race result was sealed. However, there was one more twist, and crash, to come as the No.4 Hexis Aston Martin DB9 lost traction just a minute after the Safety Car's reintroduction, elevating all four GT-R's up a place, and sealing an excellent podium spot for the German duo of Krumm and Luhr. Speaking afterwards, Lucas Luhr of the No.23 JR Motorsports Nissan GT-R said: "This is a fantastic result for us, especially considering that we didn't pass Q1 in Qualifying for the first time this season yesterday - to finish fourth and third in today's two races is great, and we must thank Nissan and the JRM crew for all their hard work." "I think that the weather helped us today. It was really tough going keeping the car on track, even at low speeds behind the Safety Car, and things really went our way with what happened to the other cars ahead of and around us. With a bit of luck we were able to claim third in the race where it really mattered." Luhr's team-mate, Michael Krumm added: "I am very happy with the result. I can honestly say that I pushed as hard as I could out there today, but at times I felt it was a bit risky and I was in danger of hitting the pit wall. The GT-R felt great out there, and I'm delighted to still be leading the Championship after what have been two very tricky races in China." "Now it's on to the final race of the season in Argentina. I think it's a track that's likely to be suited most to the Astons, but at the same time the GT-R has improved a lot since we raced at San Luis last year. It won't be easy, but we will work hard to match their pace there and hopefully we will be able to get the job done."